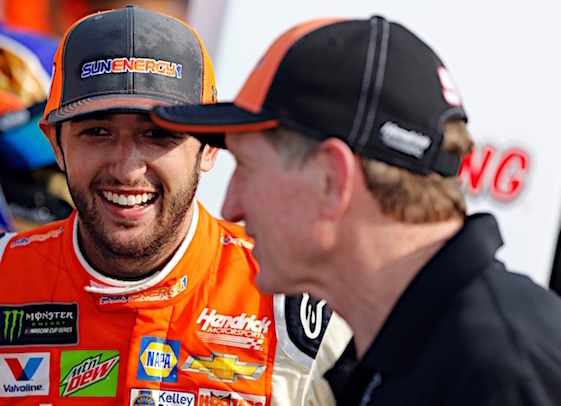 WATKINS GLEN, N.Y. – Like father, like son played out like anything but a cliché Sunday afternoon at Watkins Glen International, where Chase Elliott mirrored father Bill en route to his first NASCAR Cup Series victory. Nearly 35 years after “Awesome Bill” scored the first of his 44 Cup victories on the now-defunct Riverside (Calif.) International Raceway road-course, Chase captured his first series win with a near-flawless drive in the 33rd annual Go Bowling at The Glen. And once again, the good folks of Dawsonville, Ga., have a hometown hero to brag on. Elliott held off the relentless pursuit of Martin Truex Jr., the reigning Monster Energy NASCAR Cup Series champion, over the final 34 laps en route to a margin of victory of 7.560-seconds. Elliott’s lead, however, had shrunk to just 0.402-seconds on Lap 88 of the scheduled 90 around WGI’s 2.45-mile/11-turn natural terrain layout. With his NASCAR Hall of Fame father serving as spotter, Chase nearly threw the script away when he missed the entry into Turn 1 on the final lap…only to quickly recover…and finally breathe easy as Truex ran out of fuel. “I nearly blew it there…yeah, don’t do that,” said Elliott, who started third in the 37-car field. “Yeah, so I had a decent gap coming to the white (flag) and I felt really good about it. I felt too good about it apparently. I started wheel-hopping and I had two options _ knock it out of gear, or spin out. So, I chose to knock it out of gear and missed the corner, but luckily had a big enough gap where Martin wasn’t next to me. I felt like if I could just be in front of him before the Esses _ it’s typical you can gap a guy through there just because it’s so fast _and what a day. It worked out. Like Truex, Elliott ran out of fuel during his cool-down lap in the No. 9 SunEnergy 1 Chevrolet Camaro ZL1. That prompted Hendrick teammate and seven-time Cup champion Jimmie Johnson to push the disabled car onto the front straightaway. Elliott rolled to a stop along the pit wall and was greeted by crew chief Alan Gustafson and his crew along with the cheers of fans in the sold-out grandstand. Ironically, 22-year-old Chase posted his win one day after his 62-year-old father announced his return to NASCAR racing later this month. Bill Elliott shocked the sport Saturday by agreeing to a one-off “comeback” with GMS Racing, led by former crew chief Mike Beam, in the No. 23 Camaro for the NASCAR Xfinity Series race at Road America in Elkhart Lake, Wis., on Aug. 25. It will be Elliott’s first start in a NASCAR national touring series race since July 2012. The elder Elliott scored the first of his 44 Cup wins in the Winston Western 500 at Riverside International on Nov. 20, 1983. Elliott, who started 10th, wheeled his No. 9 Melling Oil Pumps Ford into the lead over the final five laps of the 119-lapper to finish in front of Benny Parsons. The man who went on to become a perennial choice as NASCAR’s Most Popular Driver, Elliott said he experienced eerily similar emotions here from his spotter’s perch in the track’s Bus Stop/Inner Loop section. Truex, who started alongside Elliott in Row 2, was chasing a third consecutive road-course win dating to his victory here last summer. Truex only led four laps on a day that saw Elliott pace a race-high 52 and third-place Kyle Busch lead 31. But after the final round of pit stops under caution on Lap 55 _ during which Busch experienced a fuel probe problem _ the race morphed into a one-on-one between Elliott and Truex. “I gave it everything I had every single lap,” said Truex, driver of the No. 78 5-hour ENERGY/Bass Pro Shops Toyota Camry fielded by Furniture Row Racing. “I could catch him but right when I got close, I’d get loose and fall back. I was too loose all day. Traffic made it worse for sure. He had the upper hand there at the end. Truex, in fact, had recovered from a bobble while exiting the Bus Stop on Lap 89, which allowed Elliott to momentarily “expand” his lead to 0.822-seconds. A six-time winner this season, Busch consoled himself by exiting the Finger Lakes facility with a 70-point lead over championship rival Kevin Harvick of Stewart-Haas Racing, who finished 10th. His return to pit road after only taking on eight gallons of fuel dropped Busch from the lead on Lap 56 to 17th on Lap 61 and forced him into full hair-on-fire attack mode. The result was “Rowdy’s” 12th top-10 finish in 14 races at The Glen. “Yeah, it’s great. I had a fast race car and did a good job behind the wheel, I guess,” said Busch, who started alongside JGR teammate and pole-sitter Denny Hamlin. “It doesn’t show anything for the result that we wanted to get. It’s kind of frustrating when you know you come here every year with a vengeance to go out here and win this race and you’re the fastest car or arguably the fastest guy and not able to perform or execute, I should say. The performance was awesome. “Can’t say enough about Chase Elliott and the No. 9 team. They had a great race car. I wish that we could have raced with him a little bit there. Obviously, congratulations for his first win. That’s pretty cool. He passed me there in the mid-point of the race. He had me under pressure _ had me loose and I had a couple bad exits, so gave way to him _ let him have it and tried to hang with him and he drove away from me. Then on the next restart, we got in front of him and drove away from him, so I think we were pretty equally matched. Almost lost in the hoopla was the fact that Elliott gave team-owner Rick Hendrick his landmark 250th Cup win _ and only second of the season for the first-year Camaro ZL1. Elliott said he tried to chat with Hendrick while standing on the tarmac moments after the race. “Actually, I couldn’t hear him on the front stretch when he originally called, so I have no idea what he said,” Elliott said after his 11th top-10 finish of 2018 and first top-10 in three races at Watkins Glen. “He probably couldn’t hear me, either, so he doesn’t know what I said. So we basically just sat on the phone for a minute. “I did get a chance to talk to him when we got out of Victory Lane, and he just said that he’s proud of me. His efforts and his belief in me dates back further than a lot of people’s, and I’m sure he caught a lot of flak for helping me through the times that he did. He has put a lot of faith and confidence in me over the years since I was, I think, 15-years-old to try to help me progress and move forward and get me to the point that I’m at today.